Fileless attacks are estimated to account for 35 percent of all attacks in 2018, according to Ponemon Institute. Threat actors can use a combination of exploits, scripts, and “living off the land” to stay under the radar. They can even carry out sophisticated attacks without ever installing malware on compromised endpoints. They can also use common networking and admin tools together with traditional malware to maintain persistence while locating and stealing valuable data. By monitoring user and device behavior, organizations can detect anomalies that indicate an attack is under way. Because most fileless attacks start with a vulnerability exploit, advanced endpoint protection can block the initial step of an attack from succeeding in the first place. Join us on April 26 as we discuss how organizations can detect and stop all stages of fileless attacks. 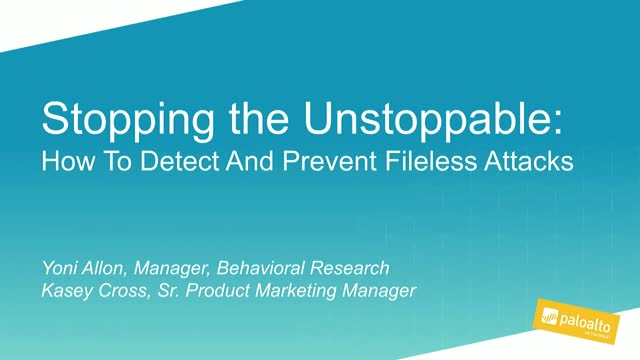 •Learn how Magnifier behavioral analytics, the first app of the Palo Alto Networks Application Framework, can detect the network behaviors associated with fileless attacks. •Understand how Traps advanced endpoint protection can block the exploits that lead to endpoint compromise.